This essay responds to experimental psychologist Steven Pinker’s latest book Enlightenment Now, which celebrates the successes of modern technological progress and rationality, while placing substantial optimism in “big data” as the savior for addressing crises such as climate change. While there have been numerous engaged critiques recently published, which review Pinker’s latest book (e.g. this, this, this, this, and this), few have expounded on the colonial relativism and mechanistic human-nature dualisms inherent in his brutal defense of rationalism at all costs. 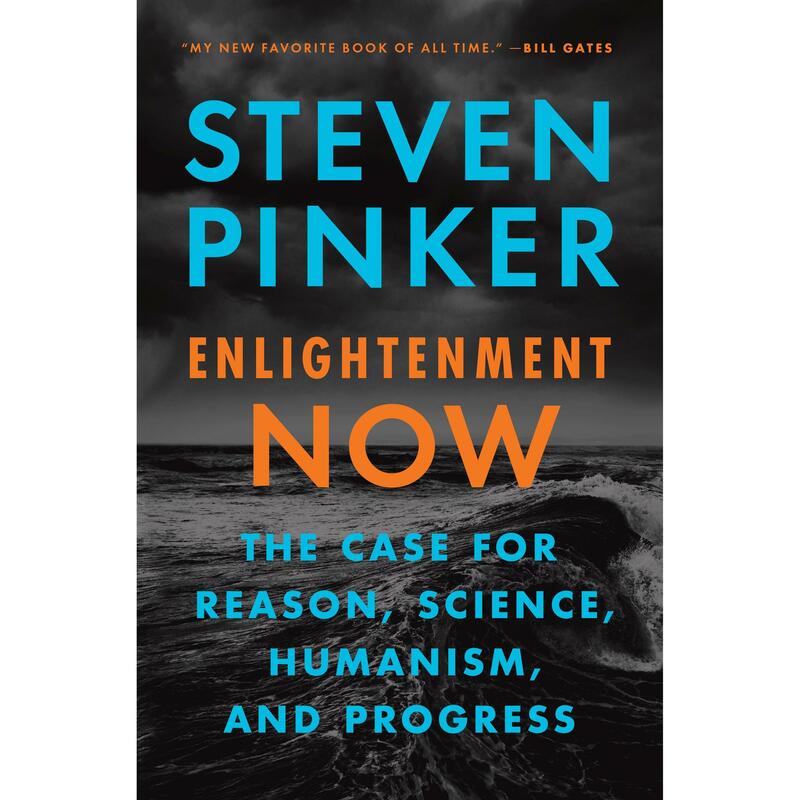 Pinker’s claim is that technocratic progress rooted in science, reason and liberal humanism has made humans happier, healthier and less violent than ever before in history, and it’s all thanks to the modern ideals of the Enlightenment. He recognizes challenges such as climate change and offers an eco-modernist prescription in arguing that reason, progress and technology can adequately decouple human activity from environmental impact. Eco-modernists advocate hyper-technological futures to intensify and optimize human activity in smaller spaces so to leave more room for nature (viewed as something outside of humans). The Western modernity that Pinker glorifies is one presumed to be universal, in which history as the evolution of (European) progress moves steadily towards a single destination, one which is better, more advanced, and more liberated than the past. 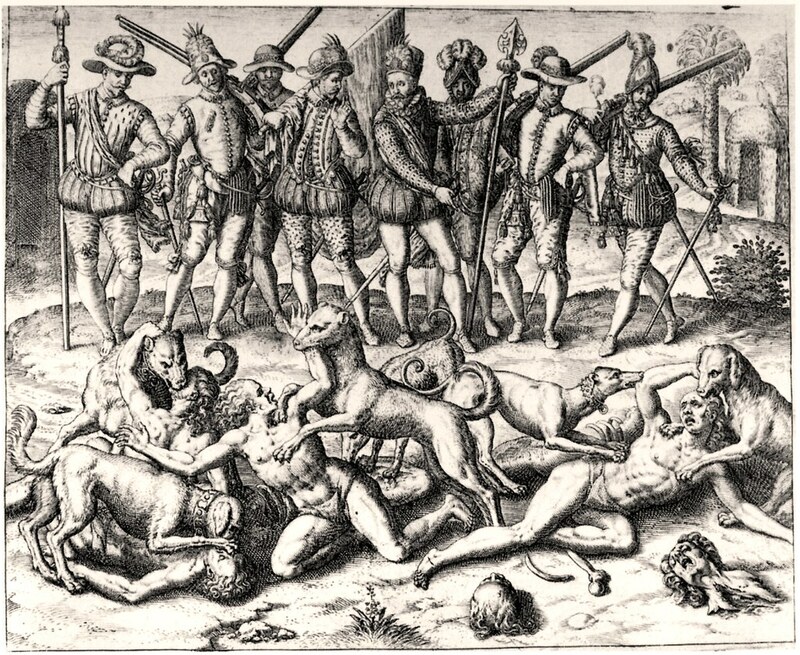 The violence of colonization, as portrayed in “The Massacre of the Indians” by Theodore de Bry (1594). This violence continues to day in the form of cheap labor. I argue that this is a relativist position. There is no way of knowing how a development trajectory that isn’t based on violent yet “rational” subjugation of peoples and natures, and is instead based on empathy, affect, commoning, and long-term planning could have gone worse or could possibly have re-imagined our present condition. Indeed, alter-modernities exist and have always existed in the present. These refer to the continuous emergence of political struggles (re)articulating a different, more emancipatory and less oppressive (and non-Western) kind of modernity. We need only think of the Kurdish Liberation Movement who actively use the term “democratic modernity” to convey ethical values and democratic principles that do not proscribe what society should “objectively” do to achieve a fixed and pre-determined democratic, ethical, or moral outcome. Instead, their political infrastructure rests upon self-reflection, as a society subject to continuous transformation from within. By making an absent relativist claim, Pinker does two interrelated things. Firstly, he rationalizes and erases the ongoing lived struggles and violence of generations of people as the consequences of an increasingly “progressive”, more intelligent, and technically-capable type of humanity. Secondly, his narration of “progress” roughly reflects that of the European experience of humanity on earth, one that was wrought on the exploitation of dark-skinned bodies, the erasure of indigenous worldviews and the pillaging of natural and human resources in colonial territories. Europe and its strategy for development is viewed as the universal prototype, for which one might rationally define what development even refers to. In this way, the idea of “what is” development, progress, liberation, or advancement becomes tantamount to an unquestioned essence. How then does Pinker rationalize the violence of his faith in Western “progress”? 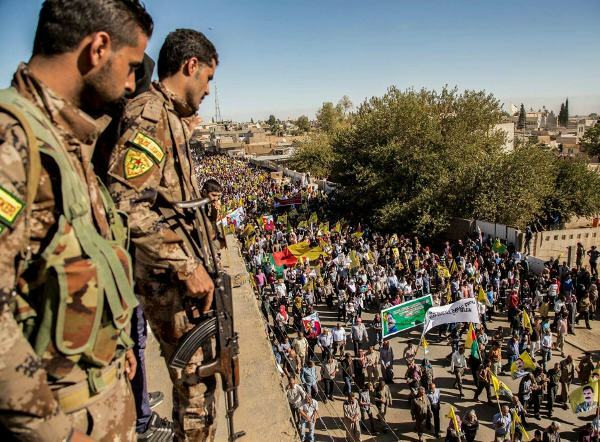 Let’s return to the example of the Kurds in Syria, who are attempting to create a democratic, egalitarian, and eco-sensitive society, whicht combats systemic oppression. The Kurds of Afrin are currently being attacked by a violent illegal invasion by a Turkish regime who considers them “terrorists”. Yet, Turkey remains backed and supported by Western “democracies” under the rationalizing logics of geopolitical stability and the maintenance of geopolitical order … a very Kissinger-esque position. Similarly, billion-dollar arms sales are justified by Western countries as simply doing business. The corollary here is that hundreds of thousands are displaced or die as human pawns within the rationalized logic of a “trickle-down” effect from the global economic growth associated with weapons sales. In Afrin, northern Syria, Kurds protest Turkey’s invasion as YPG (People’s Protection Unit) members look on, 24 January 2018. Source: Kurdish Struggle, CC/New Internationalist. This brings me to my second concern, the mechanistic way by which Pinker defends rationalism through eco-modernism. From an environmental perspective, Pinker admits he is no expert. Yet, he devotes an entire chapter in Enlightenment Now to the environment as it interacts with “progress” while failing to engage with entire disciplines of research, which interlink sociology and space, human-nature dialectics, or ecological economics. He latches on to entropy as an inevitable process of energy use but attributes the agency of entropy to humans alone, claiming that the evolutionary fight against entropy is what differentiates humans from nature. He argues that it is because of entropy that humans can never live in harmony with their environment, unlike other mammals (or other species). This position quintessentially hammers in a disturbing human-exceptionalism and human-nature dualism at the core of his thinking. Not only are other species also entropy-generators, but Pinker ignores the qualitative aspect of the experience of material degradation as the continuous transformation of social-spatial and socio-temporal relations. It is these qualitative aspects that reflect how humans experience, react and respond to transformations of space (whether on the input or output side), by contesting, disobeying, and rerouting the structured “ordering” that takes place in the construction of a society and in the consolidation of power. Though Pinker adopts a thermodynamic understanding to environmental impacts, his approach is entirely mechanistic. As ecological economist Nicholas Georgescu-Roegen, claimed, relations between humans and nature are dialectic, intimate, and relational because they are thermodynamic. They are not mechanical or Newtonian the way economic production treats them, nor are such relations mechanical in the way Pinker refers to the processing of information by evolving organisms. The obsession over mechanical logics of fixing time and space treats the experience of life as a giant algorithm simply awaiting more sophisticated number-crunching to finally crack. Alternative geographies of resistance to the otherwise colonial trajectories through which economic activity pierces new commodity frontiers are never allowed to follow their own course, unless they can be represented in rational and more controllable ways. 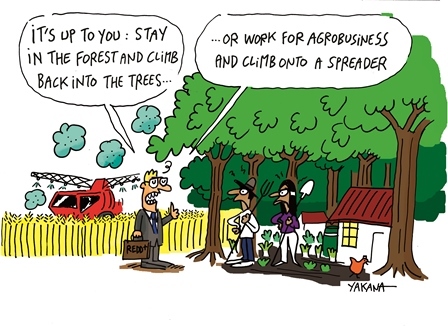 As examples of rationalizing the pleas against simplifying human-nature relations, we need only think of fair trade and organic certification schemes for producing healthy and equitable food; carbon-pricing to internalize market “externalities” in combating climate change; and REDD+ schemes for wealthy industrialized societies to offset their ongoing consumptive carbon pollution by paying poor forest-dwelling communities in the global South to curtail pre-industrial agricultural development. In the latter example, “progress” is defined as “win-win”, i.e. mollifying the ethical dilemma of climate responsibility while minimizing obstacles for the establishment of industrial agriculture. To solve the global warming crisis, multinationals are suggesting false solutions, such as REDD+ schemes. Source: La Via Campesina/Yakana. Under that self-assumed and absolutist framing devoid of qualitative significance and meaning, yes, violence has indeed declined. But it is terribly arrogant to assume that for such a model to hold, all human and non-human natures “must” act in mechanical unison to manage any potential risks that prevent Pinker’s violently-constructed “non-violent” world from falling apart. In short, undoing violence, i.e., the violence of lived experience that cannot be codified or mechanistically modeled, requires a radical project of decolonization. This means seeing through the lens of non-Western ideals of what liberation and emancipation of the human spirit could also mean. A world de-escalating in violence is one where knowledge need not be translated, interpreted and assimilated into established Western (and European) modes of scholarship, lest it be brandished as backwards or orientalist, or any other degree of subtle derision. It means, delinking and debunking the parameters and thought structures that define what counts as knowledge, or what counts as critical philosophy and thinking. It means defining “progress” beyond a singular techno-rational future modelled after Europe’s particular development trajectory and which separates those societies that are “developed” from those that are “developing”. It means recognizing that what makes societies supposedly “developed” required (and continues to necessitate) the exploitation of humans and non-human natures through colonial and imperial practices. It means freeing ourselves from colonial thought structures which make us explain and measure bodily violence through rational explanation alone, rather than on myriad other ways of relating to each other. A de-escalation of violence on the other hand is one where the borders, divisions, and classifications that condense into Western rational “progress” are no longer allowed to impinge on the qualitative lived experiences of the human and their relations with others, including non-human natures. Vijay Kolinjivadi is a postdoctoral researcher at the Université du Québec en Outaouais. Trained as an ecologist, his research takes a social science perspective in theoretically and empirically exploring the conceptualization of human-nature relations as “ecosystem services” and especially the political economy of payments for ecosystem services (PES) interventions. A shorter version of this article will be published at The Conversation. Steven Pinker is an idiot and sycophant of Bill Gates, the plutocrat. Never read anything by S Pinker,but wit an argument like that,us anybody listening to his work?